Richard Bell, 'The Dinner Party' (2013). Richard Bell, 'Scratch an Aussie' (2008). Richard Bell, 'Scratch an Aussie', 2008 (detail), still from HD video, courtesy of the artist and Milani Gallery, Brisbane. Leading Australian artist Richard Bell’s trilogy of video projects digs beneath the veneer of cultural integration to expose how racism can be deeply embedded and passed on to future generations. Imagining Victory is a significant solo exhibition of Bell’s highly acclaimed and provocative works Scratch an Aussie (2008) and Broken English (2009) as well as the culminating work The Dinner Party (2013). These videos expand upon narratives and concepts developed within Bell’s artistic practice that draw heavily upon the mechanisms of activism. Scratch an Aussie adopts the form of a Freudian therapy session in which Bell opens up to a therapist (played by Gary Foley) about his perceptions of race relations. 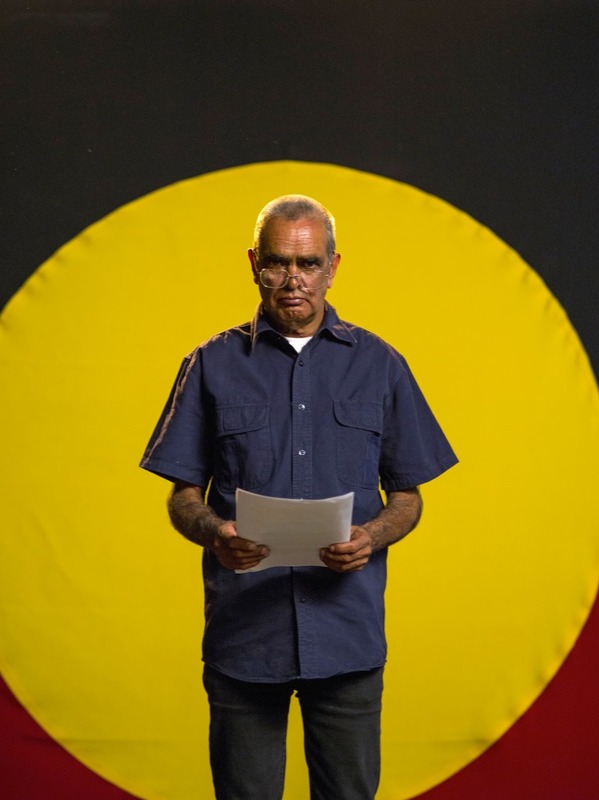 This session is interspersed with Bell assuming the role of therapist for a group of young blonde-haired Australians as he urges them to frankly discuss their concerns and attitudes to Aboriginal people and issues. Broken English concentrates upon issues relating to Aboriginal political empowerment. 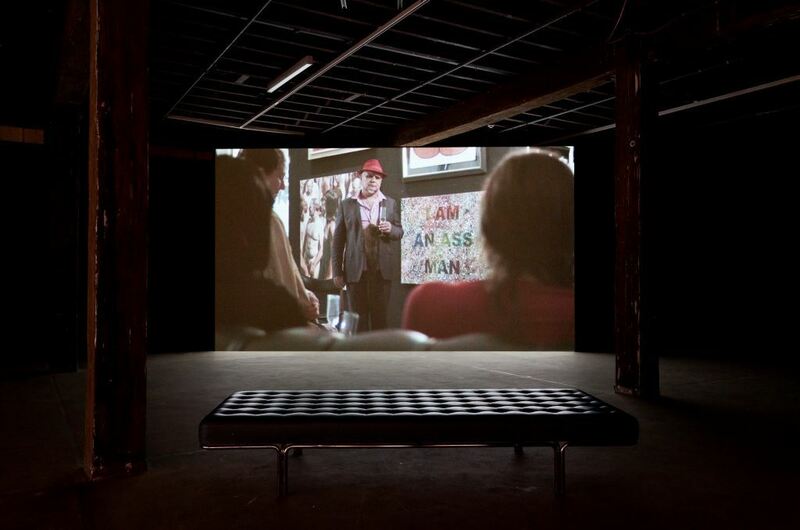 Incorporating the diverse contexts of a chess game, a gallery opening and an Australia Day re-enactment of Captain Cook’s landing, the work questions how history is recorded and framed within the present, and how both politics might contribute to and be embedded within the arenas of cultural production and presentation. The Dinner Party is a provocative work that utilises Sydney’s iconic harbour as a backdrop for a well-catered dinner party in a luxurious mansion. Over the course of the dinner, the guests speak of their views of the interrelationship between Aboriginal and non-Aboriginal people in this country. These conversations and discussions occur within a context of privilege, both economic and social, and far-removed from the most obvious sites of Aboriginal disaffection and political, cultural, social and economic inequities. An Artspace exhibition, toured by Museums and Galleries of NSW. Richard Bell describes himself as ‘an activist masquerading as an artist’. He has been a leading force within the field of contemporary Australian art since the 1990s, making works that confront the histories and present issues surrounding race relations. Bell frequently integrates expressions of political, cultural, social and economic disenchantment emerging out of the uneasy relationship between Aboriginal peoples and colonial migrants to Australia.